Determined to reap the benefits of Manifest Destiny, the Donner Party was destined for despair and death from the very start of their westward journey. A combination of indecision, infighting amongst families and a lack of leadership contribute to their tragic downfall at Truckee Lake. 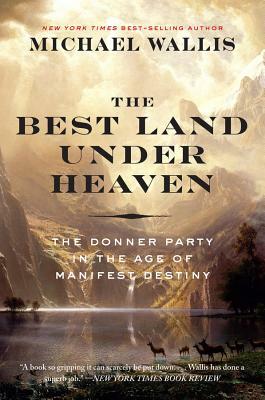 In “The Best Land Under Heaven,” author Michael Wallis recreates the Donner Party’s ill-fated attempt to cross the Sierra Nevada mountain range during the violent winter season of 1846, their imminent starvation, reduced to catastrophic cannibalism to survive. The result is a cautionary tale infamously staining the chase of the American Dream forevermore. "WESTWARD HO FOR OREGON AND CALIFORNIA "
In the eerily warm spring of 1846, George Donner placed this advertisement in a local newspaper as he and a restless caravan prepared for what they hoped would be the most rewarding journey of a lifetime. But in eagerly pursuing what would a century later become known as the "American dream," this optimistic-yet-motley crew of emigrants was met with a chilling nightmare; in the following months, their jingoistic excitement would be replaced by desperate cries for help that would fall silent in the deadly snow-covered mountains of the Sierra Nevada. We know these early pioneers as the Donner Party, a name that has elicited horror since the late 1840s. With The Best Land Under Heaven, Wallis has penned what critics agree is "destined to become the standard account" (Washington Post) of the notorious saga. Cutting through 160 years of myth-making, the "expert storyteller" (True West) compellingly recounts how the unlikely band of early pioneers met their fate. Interweaving information from hundreds of newly uncovered documents, Wallis illuminates how a combination of greed and recklessness led to one of America's most calamitous and sensationalized catastrophes. The result is a "fascinating, horrifying, and inspiring" (Oklahoman) examination of the darkest side of Manifest Destiny.